This card is made for the current challenge over at Less Is More which this week is *Stars*, although I could of used this card for last weeks challenge of polka dots too! 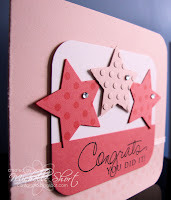 I have first taken some PTI Sweet Blush CS and made a card base from it rounding two corners with my WRMK Corner Chomper. I have then stamped the polka dots from the PTI Polka Dot Basics set in VersaMark ink. I have cut a slit in the edge of the card and wrapped white WRMK Floss around. I have then taken some PTI Stampers Select CS, cut into a square and and rounded the corners. A strip of PTI Berry Sorbet CS has been added to the bottom and the gretting from the PTI Signature Greetings set stamped with black ink on top. 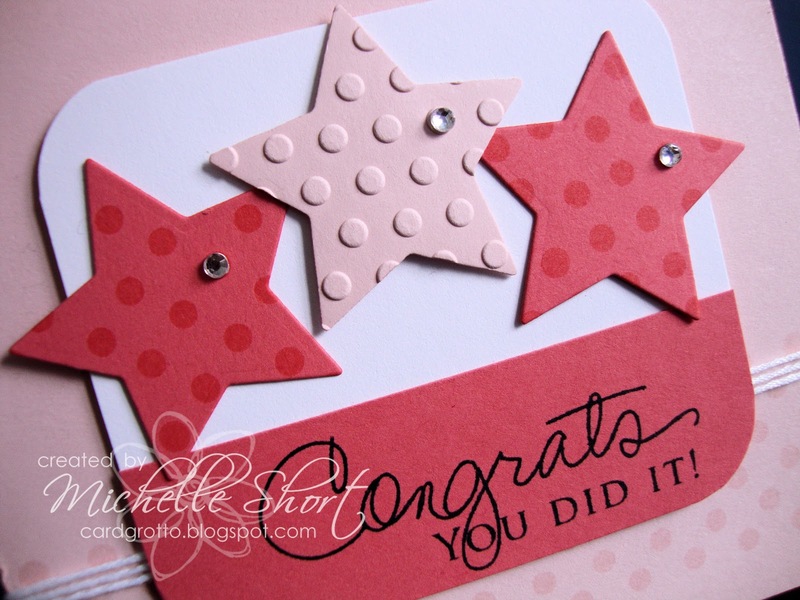 I have cut some starts using Nestabilities dies, stamped two with the polka dots and embossed one using the Cuttlebug Polka Dots Embossing Folder. These have then been added to the panel with my ATG and the centre one with 3D adhesive squares. The panel has been added to the card base with more 3D adhesive squares. DB Jewels added to finish. STAMPS: Papertrey Ink. INK: Memento Tuxedo Black, VersaMark. CS: Papertrey Ink. TOOLS: WRMK Corner Chomper, Nestabilities Dies. EMBELLISHMENTS: WRMK Floss, Doodlebug Designs Mini Jewels. This is gorgeous. So simple yet really elegant. I love it. This is stunning Michelle. A great design. This is lovely Michelle! 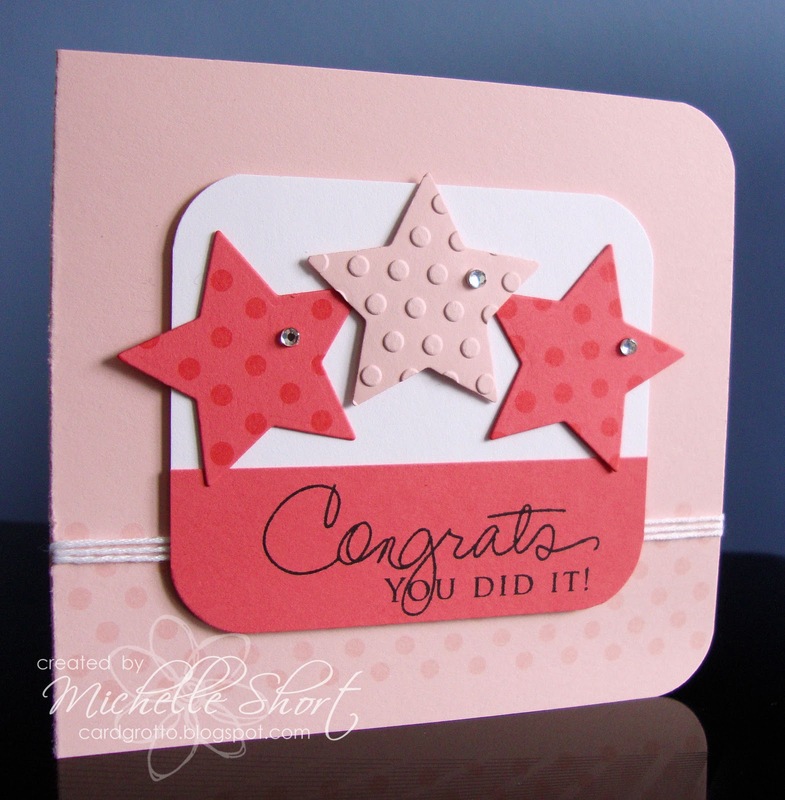 I love the tone-on-tone polka dot background and the jewel-embellished stars. Fab card Michelle! The colours, spots and stars all work so well together! Beautifully CAS, love the bakers twine and the pink colour combo. What a lovely card Michelle! Stars and polka dots - 2 of my favourite things! Gorgeous! wow this is gorgeous Michelle!